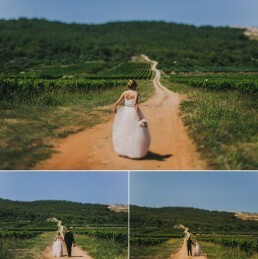 Destination weddings are more and more popular option for weddings, and it is already well-known that Croatia offers plenty of gorgeous locations on which many of the local and tourist couples decide to exchange their vows and celebrate marriage. 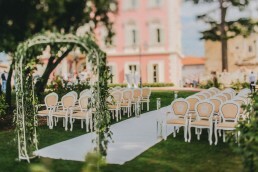 Magical Istria and Dalmatia offer some of the most popular and beautiful wedding destinations, not only in Croatia but in the world. 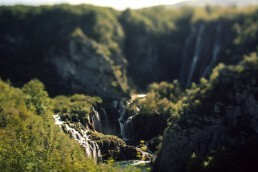 Croatia is a treasury filled with fairytale locations, from Adriatic Sea, the hills of Zagorje, the mountains of Gorski Kotar and Lika, to Slavonia plains. Destination weddings emphasize the special place and mood which will make your wedding day more beautiful, so it is normal that couples choose them. With the occurrence of the destination weddings it is more common that individual photographers are declaring themselves as destination wedding photographers. 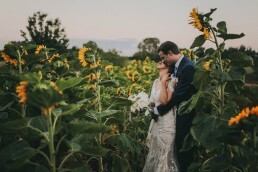 It can be demanding to be a destination wedding photographer, but the photographers simply enjoy these kind of weddings because if the location is beautiful and special, it gives a memorable aesthetic view of the photography. 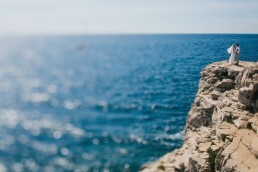 Photogenic locations are usually the ones in the nature and outdoor. 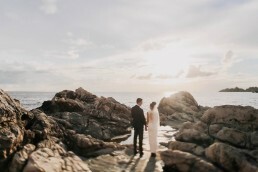 Even though our Adriatic Sea is gorgeous and irreplaceable, you don’t have to necessarily choose the wedding destination near the sea for the scenes to be perfect. Sometimes an old stone house or vineyard hills can be a very interesting motif for photography. 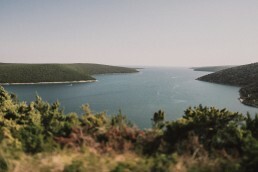 The palette of impressive locations in Croatia is really wide, so we will select our favourite and most photogenic places which should definitely be taken into account when choosing the perfect destination. A well-known magical destination attracting tourists from all around the world is a perfect wedding destination. Besides picturesque Rovinj which is by itself a mecca for newlyweds and the photographers, and the gorgeous Villa Polesini in Poreč located right by the sea, we shouldn’t ignore the heartland of Istria that offers fairytale motifs; old stone houses and Istrian kažun (round or cone shaped, stone shelter without windows), vineyards, olive groves, hills and interesting small towns. Towns like Motovun and Grožnjan are a great choice. Our favourite wedding destination with a theme “Istrian village” is Agrotourism Paladnjaki in the heart of Istria, which, besides great local food, offers idyllic mood of Istrian village with old stone houses, surrounded with green plains and flowers, relaxing pool and romantic lanterns along the whole garden. Another one of the special locations in the heartland of Istria is the beautiful Stancija Meneghetti, a rustic villa located in Bale and surrounded by nature and vineyards that gives all its visitors perfect peace and luxury. 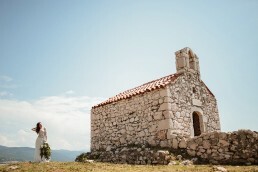 If you are planning a church wedding, take into account that you can find some of the most beautiful old churches in Istria. With crystal blue Adriatic Sea, islands and fascinating historical towns, Dalmatia most likely offers the largest number of wedding destinations. Besides the majestic Dubrovnik, there are also the gorgeous Dalmatian islands and the city of Split. Hvar town offers gorgeous hotel terraces in the very centre of the town, just like the terrace San Marco of the centennial Palace hotel with the view of the main square and the sea. The luxurious beach Bonj would provide not only a beautiful backdrop for the wedding ceremony but a great setting for the wedding reception and party! Take a look at our latest Bonj beach weddings! 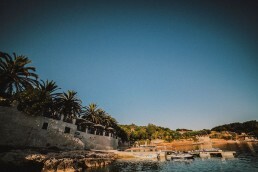 Hvar’s island, Palmižana, is home to one of the Croatia’s exclusive seafood restaurants Laganini Lounge Bar. Made from nature but still very elegant, Laganini Lounge Bar is a great place for a wedding! Located on a beautiful island of St. Klement, near Hvar town, restaurant Zori is an elegant venue with a beautiful view of the Adriatic Sea. 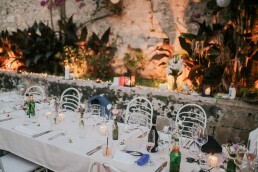 Surrounded by stone walls, in the shade of beautiful tall palm trees, it makes a great place for an outdoor reception perfect for hot summer nights. 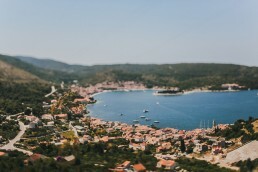 There are the Paklinski Islands with the Saint Kelement island (the largest of Paklinski Islands) one of the most beautiful and photogenic wedding destinations, which, along with the natural beauty, also offer excellent restaurants Zori and Toto’s, perfect for romantic weddings by the sea. 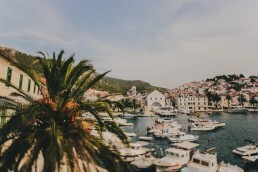 Many will say that it is one of the most beautiful islands of the Adriatic Sea and increasingly popular wedding destination. 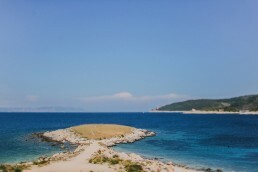 A beautiful fort on the Vis island with a big terrace in the tree shadow with romantic lanterns and right by the sea. A tavern located in the Vis town, between old stone houses and filled with greenery. It is a perfect location for smaller outdoor weddings. 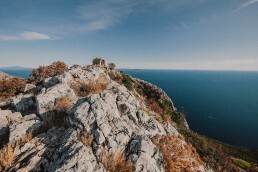 Along Istria and Dalmatia, the Kvarner Gulf is often unfairly neglected location, and it offers one of the most beautiful pearls of the Adriatic Sea, town Opatija. Opatija is a beautiful and elegant tourist location with rich Austro-Hungarian history, located at the foot of the mountain Učka with plenty of old and luxurious villas and hotels, a beautiful park and the sea. It is known that Opatija is filmed and used as a backdrop in movies and was visited by many historically important and famous people. 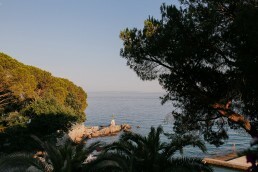 Opatija is also a perfect backdrop for a wedding! If you want an elegant wedding with a dash of the old glow of Opatija, the best choice is a beautiful hotel Kvarner founded in 1884. with the Crystal Hall, one of the famous ball halls in Croatia and elegant terrace with the view of the sea. 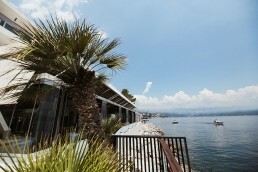 For a modern view of Opatija, a perfect choice would be restaurant Bevanda, with its perfectly decorated space and rich gastronomy. 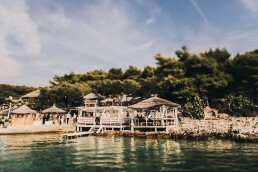 Close to the restaurant, a new beach Lido is currently decorated as the most luxurious beach in the Adriatic Sea making it a perfect spot for a wedding! In the north part of Croatia, far from the sea, there is a picturesque pearl surrounded by green hills; the baroque town of Varaždin. Wherever you turn, you will find interesting motifs and perfect scenes for a special destination wedding. Our choice is a beautiful fort of the Old Town which is definitely unusual sight and more than a spectacular wedding destination. Another one of the impressing sights and locations in Croatia is a fairytale castle Trakošćan. Beautiful historical castle, which rises over the landscape, is mirrored in the lake and surrounded by decorated nature. Located only an hour from Zagreb, Trakošćan makes a perfect sight for fairytale destination wedding. 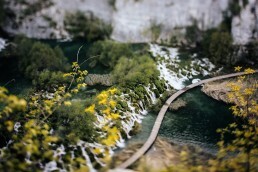 One of the most visited and most beautiful destinations in Croatia. Did you know that these crystal turquoise lakes and majestic waterfalls, surrounded by untouched nature, can be your wedding destination? 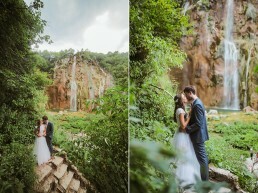 Wedding by the Large Waterfall or by the beach of the largest lake, sounds like a dream wedding!